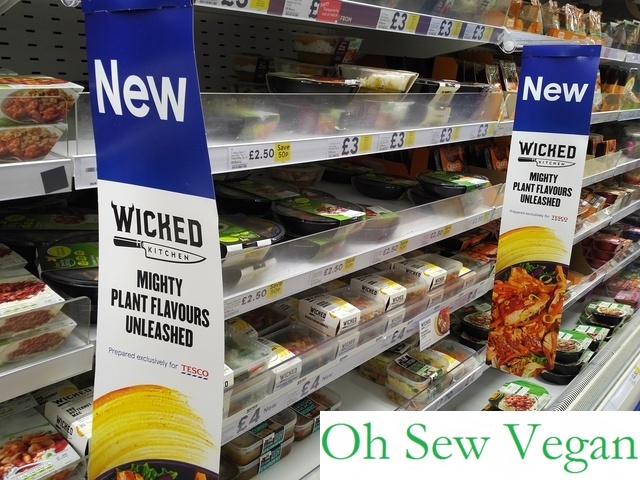 Derek and his brother Chad already run their own vegan blog, Wicked Healthy, with plenty of amazing and easy to follow vegan recipes, so it stands that they will release their range of 20 amazing products through Tesco for everyone to enjoy. 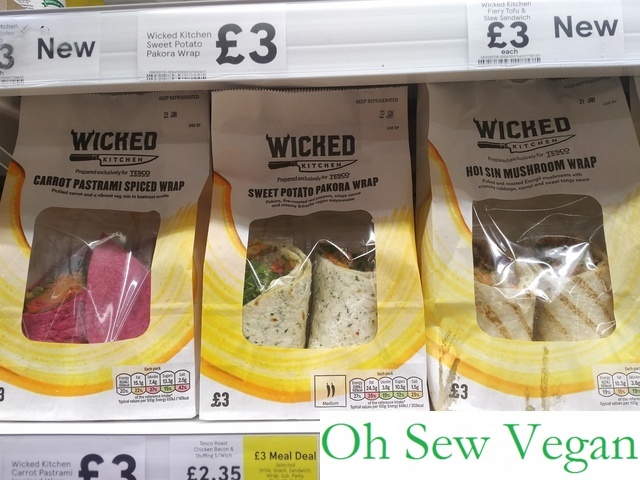 Lucky for me, I was on my way home when I read the article about the launch of Wicked Kitchen at Tesco and was able to stop by my local Tesco Extra superstore on my way home. I can tell you the anticipation I felt when walking into the store was comparable to what I was like when I got wind that vegan Ben & Jerry’s hit Tesco stores in the UK. I must’ve visited at least 4 Tesco and Sainsbury stores trying to hunt them down! 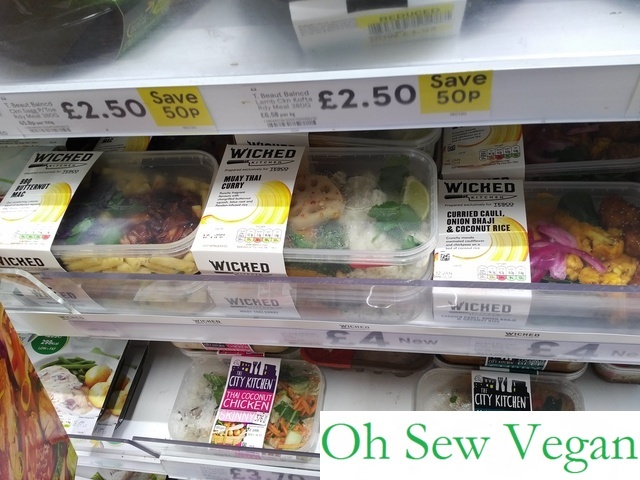 Trying to find the Wicked Kitchen range was less of a vegan food hunt and was more clear and visible from a distance. I only visited the ready meal aisle on the day the range was launched and it was already a wide range of choice to choose from. 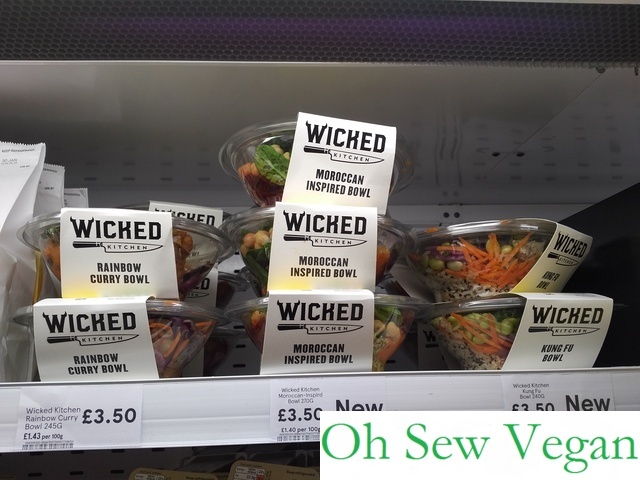 I moseyed along to the lunch chilled section another day and saw the range of wraps and sandwich available, but noticed the salad bowls came some time later. According to my calculations, 18 of the supposed 20 products are already available at my local Tesco store and judging by the fact that the salad bowls came later, they must be determining demand and introducing more products over time. So far I’ve been able to try a few things from the range and will keep trying different products that caught my eye the first day, but it won’t be on a regular basis unfortunately. Not that I’m opposed to ready meals every now and then, especially when so much thought has gone into making healthy vegan options, but the price range can be a bit off-putting and isn’t something that an average person would be able to afford to pay on a frequent basis. I’ll cover more of that later. Of all the ready meals available that I could take to work, I liked the sound of the Naked Burrito and decided to give it a try first. The big slice of jalapeno on top should have given me an indication of what to expect, but even though I removed the big slice of chilli before it went into the microwave, the spice did still permeate into the rice. This is a great option for those who like a lot of spice with their meal! Having said that, the Naked Burrito was very filling with plenty of flavour. I made sure I had a big bottle of water on hand to counter the spice, but otherwise I did like the pulled king oyster mushrooms in with the butternut squash and rice. This has got to be, by far, my favourite meal from the range. I like a good pasta bolognese but the diced mushrooms with the sauce and linguine is a genius idea! 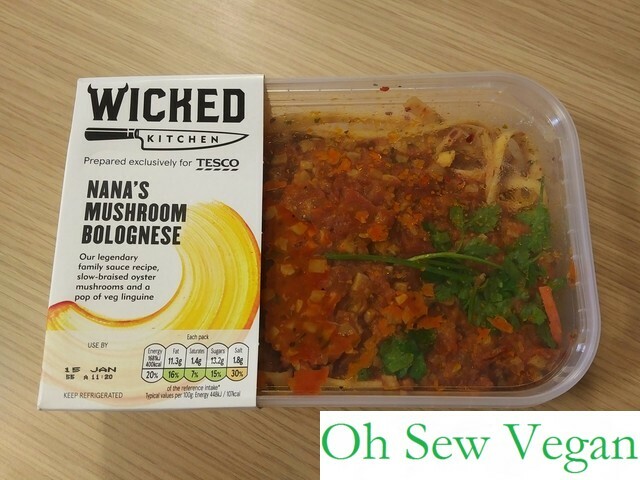 I got so worried while eating it, it had such a minced meat texture, that I was taken aback and had to check the packaging to make sure there wasn’t any meat in it! I devoured the box in no time and tried my own hand at recreating the dish at home – I’ll post my recipe for this soon. 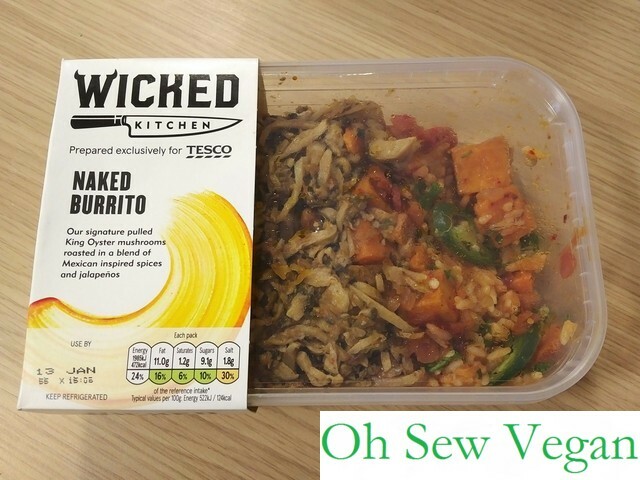 This wasn’t as spicy at all, unlike the Naked Burrito, and went down very well. When I bought it from the shop in the packaging, it seemed like there were plenty of sliced mushrooms on the top so I was impressed, but by the time we took it out of the box, we realised too late that the pizza was only good enough for one person. I can’t eat a lot of spice (and I love mushrooms) so because the Caponata pizza was marked spicy, I decided to get the non-spicy mushroom pizza. I wasn’t sure if it would be any good, so refrained from buying 2 pizzas. When it came out of the oven, I was disappointed to see how there weren’t that many mushrooms. I understand that they shrink when cooked, but knowing that fact, I would have expected a little more topping to make up for the fact that there isn’t any vegan cheese to cover up the less than generous spread of topping. 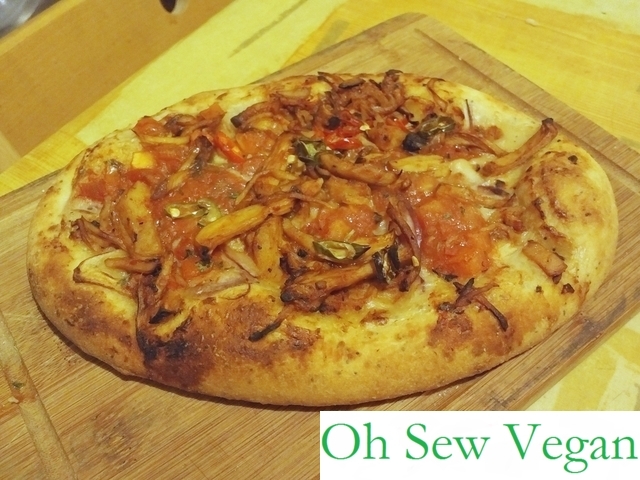 The dough dotted with poppy seeds was a nice combination of crispy with a soft doughy centre and I liked the taste of BBQ sauce with the mushrooms, but since it wasn’t marked, I was also surprised to notice how spicy the pizza actually was. It was disappointing how small it was though. My husband ate almost three-quarters of the pizza and was still hungry after. Let’s just say at £4, the pizza is a bit too expensive for one person. 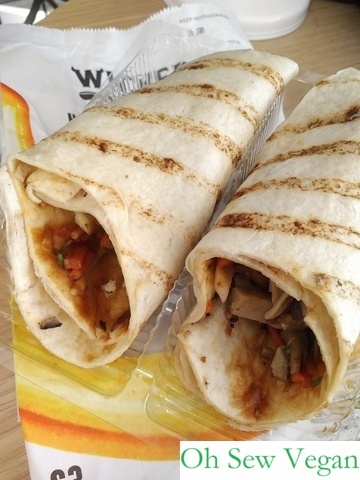 Being a big mushroom fan, it was no surprise that I had to try the mushroom wrap first. 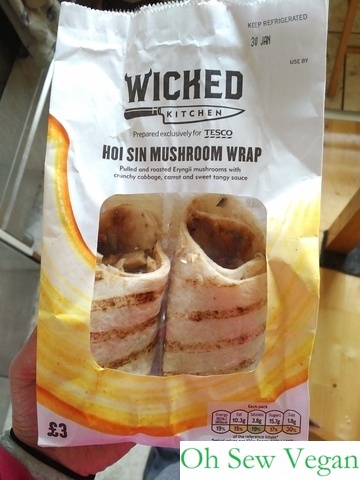 At first glance, it didn’t seem like there was much filling in the wraps, but once you bit into it, you soon realise that the weight of the mushrooms marinated in sauce is weighed down to the bottom. The sauce wasn’t overpowering and the contrast between the hoi sin mushrooms and crunchy vegetables was a very pleasing combination. The only thing I would advise is to make sure you have napkins on hand as it can get quite messy after a while! Enjoyable meal, but potentially messy nonetheless! Of all the products I’ve tried so far, I’ve got no complaints apart from the size of the pizza. 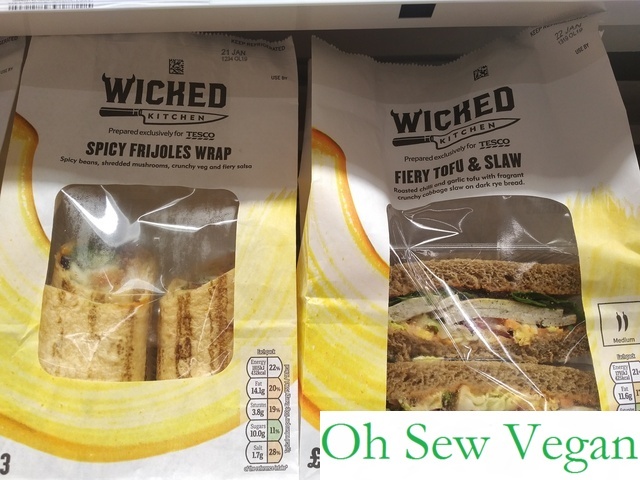 I do look forward to trying more of their range although it seems I’m in competition with other vegans to get to the goods first. After the official launch date, I went back a second time within a week to the store to find most of the products were already sold out, leaving a few ready meals on the shelf. I’m happy to see that there’s such a huge demand for the range, even in my local Tesco store, and have heard some positive and negative reviews from other vegans, but I’m confident the range can only go from strength to strength as long as they continue to offer exciting products for vegans. 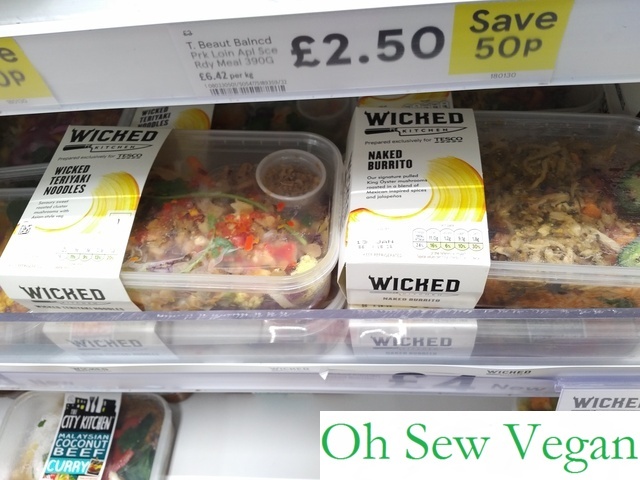 The range is a bit pricey compared to non-vegan options with pizzas and ready meals coming in at £4, salad bowls at £3.50 and the wraps and sandwich at £3. 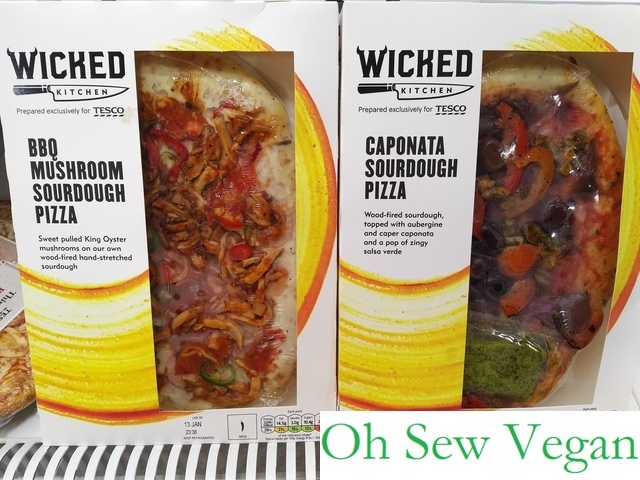 Tesco’s own brand non-vegan pizzas cost between approximately £2.50 and £3 and are much larger in size with ready meals hovering around that mark, so it seems like the Wicked Kitchen range is playing to vegans’ need for plant-based products and charging a slightly higher price. 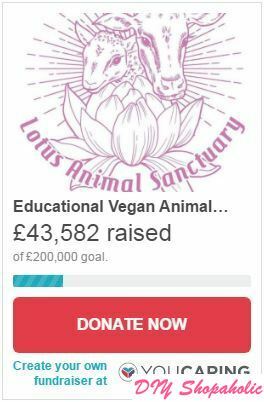 Having said that, I’m all for supporting vegan endeavours to create the demand and hope that one day the prices will be reviewed so vegans aren’t having to spend more money on options that are less costly to produce but can taste just as good. If you prefer keeping cookbooks in the kitchen, The Wicked Healthy Cookbook will be released on 31st May. You can already pre-order your copy from Amazon UK here. 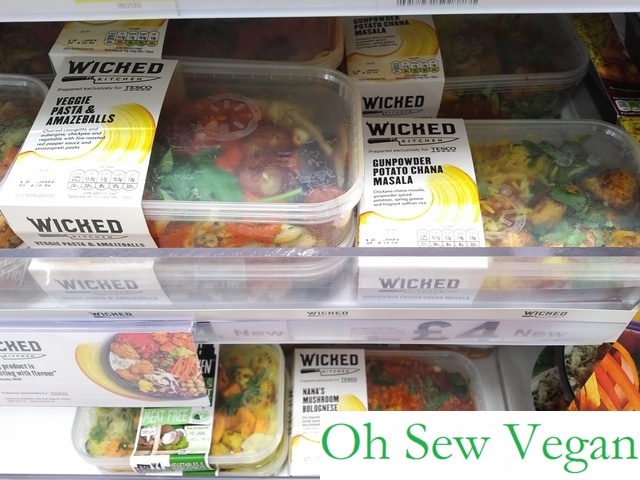 Have you tried any of the products from the Wicked Kitchen range at Tesco yet? I’d love to hear your thoughts in the comments section below!